In less than a year, I went from ‘blogging beginner’ to making over $1,000 a month which eventually grew and allowed me to quit my job and pursue my dream of becoming a physical therapist. Since I started blogging, I’ve earned over $187,000 on the side! And I now earn more online than I did as a Physical Therapist! If you want to read more about my crazy story, keep reading. 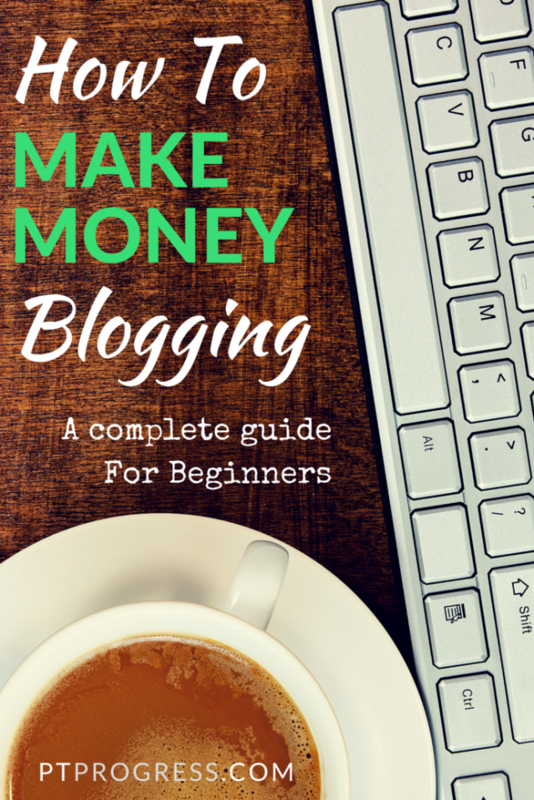 If you’re ready to jump right in and learn how I make money blogging check out the How to Set Up a Blog for Beginners section below and read on for the complete details. Fair warning: This article is LONG. If you’re serious about doing something that could change your life for the better, it’ll be worth it. My goal is to give you all the tools you need to start a successful blog and to learn how to make money blogging. An extra $500 a month is really helpful. An extra $5,000 a month is LIFE-CHANGING. I first learned about blogging in 2008 and made a miserable attempt to write an occasional post on a blogging platform called Blogger. Little did I know that within a year I would learn how to start a blog on WordPress, which opened the door to a whole new world of income for me. I was working a corporate job that paid the bills and that was actually enjoyable. It allowed me to work with people covering an interest of mine: finance. The more I learned about money and finance, the more I wanted to share and teach people. In 2009, I started reading personal financial websites and realized that many of the writers were just average people sharing their thoughts on money. I knew that I could share valuable information just like these guys, and wanted to teach others what I was learning. So in September of 2010, I launched my first financial blog. I spent about an hour every night writing about topics that I knew about money or wanted to know about money. It was my passion and I wanted to absorb and share as much as I could about it! Little did I know that consistently writing would bring in search traffic, readers, and opportunities that would eventually lead to me generating an extra $1000 a month – all in less than a year. I actually started making about $500 a month within the first six months of blogging (mostly through writing opportunities) and increased my earnings through advertising and affiliate programs. (Don’t worry, I’ll explain what those terms are within this article). For me, blogging started as a hobby and as a way for me to educate others and myself about finance. But it turned into much more than that. “Easy”, I thought. I’d go back to school for Physical Therapy. It sounds strange, especially since I’m a ‘finance guy’ and all. But I always wanted to be a part of healthcare in this way but figured that I didn’t really have a good window of opportunity short of quitting my job. Remember when I said that making an extra $1000 a month is life-changing? For me it really was! It enabled me to build our savings, learn new skills, and create a revenue stream that would eventually support my wife and I when I decided to quit my job and go back to school. So that’s what I did – In 2013, I quit my job after working 5 years in finance and started my dream of becoming a physical therapist. In just a few short years of making extra money with a blog, I was able to set aside enough income and have an income stream that would eventually surpass what I had been making in my first job after college! I can honestly say that I don’t know if I would have had the courage to quit my job and pursue my dream if I hadn’t taken that first step to start a blog. Taking that first step into blogging opened a door that allowed me to quit my job in just over 2 years so that I could pursue my dreams. I’m going to break this down into smaller parts so that it’s easy to follow. Be sure to bookmark, or pin this page so that it’s easy to reference as you’re putting together your website. The first thing I do when looking for a domain is to use Bluehost’s Domain Search to find out if the domain is even available. I have used Bluehost for a while and continue to recommend them because of their great customer service for domains and hosting (we’ll cover hosting in a second). If your business name is unavailable as an exact domain match, try expanding your domain name to include your city or region. i.e. AdvanceTherapyStLouis.com. If you have no idea what you’ll do to start and want to experiment, just start with your name and make a personal site. You can see mine here. Step 1: Go to Bluehost and secure your domain. Here’s the lowdown on hosting. A hosting company makes your website visible on the Internet. You can expect to pay about $100 a year for a website host to store your website and all its files. I’ve partnered with Bluehost to provide my readers with a special deal of $3.95 a month for hosting. I mentioned earlier that I really like using Bluehost. This was the first hosting provider I used because of the simple ‘one click installs’ for WordPress, which we’ll discuss next. And, Bluehost also provides you with a free domain when you use their hosting service! Side note: If you already have purchased a domain, you’ll have an additional step. Once you set up your hosting account (see instructions above) you will need to ‘point’ your domain to your website host. You do this by changing the DNS (domain name servers) settings to the DNS settings provided by your host. It’s usually just a matter of copying and pasting two lines (which usually look something like ns1.example.com ns2.example.com) into the DNS records at the place you purchased your domain. It may take a couple of hours for the domain to propagate, but it should point to your host in less than 24 hours. Step 3: Make sure your domain is linked to your hosting account. You may have heard of WordPress but still wonder what it’s all about. All my websites are built with WordPress. It’s technically called a ‘content management system’ or CMS that makes running a website very easy. If you use a host like Bluehost or HostGator, you’ll have access to their ‘one-click’ WordPress install feature. The WordPress backend is simple to manage and allows you to add pages and change the design by selecting themes. We’ll talk more about design next. Finding the ‘one-click install’ option at your host provider should be pretty manageable. Be prepared to set up a new username and password that will allow you to log into the back end of your website. Go ahead and save this information in the username/password document that you created earlier. Once the WordPress install is complete, you can access the backend of your site by adding this to your domain: /wp-admin. Ex. www.TheDomainYouPurchased.com/wp-admin. This will take you to your dashboard where you can edit the appearance of your website and add content. Woohoo! If you’ve purchased a domain name, connected it with your hosting provider and installed WordPress, you technically have a website. At this point there’s nothing on your site, so the next step is to set up your site design and add the content. Step 4: Use the One-Click feature to install WordPress through your host provider. This is where you can customize everything that has to do with your website look and feel. You can even add new users and give people on your team access with their own username and password. To get started, take a look at the Appearance tab on the left hand column of your control panel. You’ll see the option to click on ‘Themes.’ Themes are simply predesigned templates that you can use to further customize your new website. Sure, you can build your website from scratch, but unless you’re a web designer by trade, WordPress themes are by far the best way to go. Thousands of themes are available for $30-$60 at places like ThemeForest.net or Woothemes.com. I personally use both and suggest looking at ThemeForest first because of their huge selection. Make your way over to the site and register for an account. Purchase your theme and download the .zip file for the theme. Make sure to look for themes that are mobile/tablet friendly and have documentation, sample ‘dummy’ content and a support forum with user guides. Nearly every theme will have this, but it’s always good to know what you’re looking for. Now that you’ve purchased and downloaded the zip file from ThemeForest, you’re ready to upload it to your WordPress backend. Under the Appearance tab, click ‘Themes’ then click ‘Install Themes.’ You should see an upload button – click this to find the .zip file that you’ve saved and WordPress will automatically install the theme for you. WordPress should prompt you with a message that your theme was successfully added and will ask you to ‘activate’ the theme – go ahead and activate it. Most themes require a few additional steps in order to look like the ‘live preview’ that you saw on ThemeForest. In order for the theme to look like you expected, you’ll need to download and install two plugins in WordPress: WP Importer and Widget Data – Setting Import/Export Plugin. On the left column, click on the ‘Plugins’ tab and search for these plugins. Remember to activate them after you’ve installed them and you should be able to see them added to the left column when installed correctly. Most of the time, the instructions customize your theme with WP Importer are found in the support documentation for the theme, which can be located within the .zip file. In order to view this, just double click the .zip file that you previously downloaded and it will open as a file. Within this file, you should see a folder titled ‘documentation’ or ‘index’, which should outline the steps to use WP Importer to add the sample or ‘dummy’ pages to your site. In general, you can add the dummy content by selecting the appropriate .xml file through the upload tab in WP Importer. The WP Importer is accessed under the ‘Tools’ category; click on the ‘Import’ link. The same can be done with the Widget Data – Setting Import/Export Plugin. The great part of adding this dummy content to your site is that you can find and edit the areas by looking for the sample content you’re looking to change. This will make your life so much easier because you can just add your own content in place of the sample text. With the new visual editor option in WordPress, you can customize your pages by adding or removing elements like text boxes, call outs, and image galleries/sliders. One of the best features about WordPress is that it gives you a lot of functionality through plugins and widgets. You’ll see a tab for each of these on your WordPress dashboard. The widgets section gives you access to your website sidebar and footer and lets you add features by dragging and dropping widgets into place. The plugins area provides a search feature that lets you add a plugin for almost any functional characteristic that you want your site to have. All In One SEO Pack – Using this plugin is one of the simplest ways to improve your page rankings in Google. All in One SEO adds an area on each page and article so that you can add the keywords, description and title that helps your website to be found. Google XML Sitemaps – A site map allows search engines to crawl your site easier and to decipher what your content is all about. Consider it a road map for Google. Ultimate Google Analytics – I highly recommend setting up Google Analytics if you haven’t already. This plugin lets you add your Google Analytics tracking number very quickly, giving you priceless insight into how your visitors are finding your website. Akismet – If you plan on having a blog on your website, Akismet is a must. Spammers are constantly looking for vulnerable sites to attack with comment spam, and Akismet eliminates a ton of garbage comments form spammers. Contact form 8 – Every site needs a contact page. Your WordPress theme should come with a contact form, but if it doesn’t, this plugin makes it a snap to add one. BackUpWordPress – Hopefully your website never crashes, but just to make sure you’re ready, install this plugin. You can set it to back up your site weekly and to email the site backup to you automatically. One of the first questions people ask me when they learn about my business is “how do you make money online by blogging?” There are a few ways that I’ve found to be worth pursuing so I’ll share what has worked with me. CPC stands for cost per click. Ad networks like Google Adsense will pay the website owner based on the clicks generated through the website. Let me be clear about Adsense: it takes a while to earn a significant amount with it. Expect to work for months to earn a few bucks. I remember earning my first few pennies with Adsense and feeling so excited! It would take nearly 6 months to make my first hundred dollars with Adsense – talk about patience. Adsense eventually turned into a steady stream of income for me and was just one piece of the earnings pie. I’ve made money by selling ads directly to advertisers on my websites. The best type of direct advertisements are banner ads. In the past, advertisers would even pay to have their website linked to yours, but this has been looked upon as ‘spammy’ and is discouraged by Google. I don’t recommend this route, but just know that there still might be people trying to advertise this way. The best way to deal with them is to work on a monthly basis with an image ad to place on your site. Being an affiliate means that you get a portion of the sale for a product that you recommend. When I managed my financial blogs, I would often review financial products such as bank accounts, rewards/travel cards, and even products like bookkeeping software or online budget tools. No matter your niche, there are a ton of opportunities to promote products that you believe in and to provide reviews for your readers. I’ve found that providing honest and thorough reviews were helpful for readers as well as profitable. I use CJ.com for my affiliate earnings. One of the best things I did when I started blogging was to guest post on major blogs in my industry. Connecting with bloggers is really easy – they usually have an about page or can be found on Facebook and Twitter easily. A lot of times, they’ll even have an area on their site that shows you what to do if you want to write a guest post. The best advice about blogging that I’ve been given has been this: Write the best you’ve ever written and give it away as a guest post. This opened so many doors and relationships with other bloggers and eventually led to multiple paid positions as a staff writer on different blogs. I was easily able to write 8-10 articles a month and make about $400+ a month just in writing on other blogs. (When you’re a ‘staff writer’ many blogs will pay you $40+ an article). The great thing was that I was getting paid, PLUS I was getting traffic back to my own blogs which were growing every month from the free publicity. WIN WIN! I know you’re just starting, but I figured I’d share another way I earned through blogging. Believe it or not, other bloggers and even large companies will buy websites from bloggers. I’ve been the buyer of websites and even sold websites. It’s not something that I’d recommend to a new blogger, but once you get some experience with managing your own website, you’ll start to understand the influence you have and the traffic you bring into your site. Just be sure to track your progress by installing Google Analytics early on so that you can show how your site has grown over time. By tracking my sites with Google Analytics, I could easily demonstrate why a website was worth 5 figures – and I was able to do sell multiple sites because of this. Starting a new website is exciting, but if no one visits or reads what you’re writing, it can be discouraging. Finding readers and building your audience takes hustle. Here are a few ways that I’ve found to be effective when building an audience. If you’re starting a blog, chances are that you’ve followed someone else’s blog as an active reader. They’ve put in a lot of time building an audience, so if you approach them about contributing an article on their site be sure that it’s your best writing. That’s right. Give your best content away as a guest blog. I know what you’re thinking: But this is such a great article, it would look great on my new site! But it won’t look great at all if NO ONE VISITS! You obviously need to have compelling content on your site for new visitors to read. But when you give your best content away in the form of a guest post, you are much more likely to attract the attention of their visitors. Usually you can add a link to your website in the byline or within the content itself. Link to a great (and relevant) article on your website and make sure there’s a call to action that keeps them as a reader. Bloggers appreciate genuine references from other blogs. By genuine, I mean that you put thought into why you’re recommending their blog article or give a real review of their product or website. Consider putting together a ‘top list of…’ post that highlights your favorite bloggers and WHY they’re you’re favorite. Promote your article with a casual tweet and the twitter handle of the blogger and they’ll likely see your post. Your goal shouldn’t be to use the community as a self promotion platform. The point of being a part of a community is to give back whenever you can. Look for questions the community members have and do some research to find the answers. You’ll quickly be seen as a person who contributes and if you set up your profile correctly (whether it’s via Facebook, LinkedIn, Twitter, or a forum) the other members will see your website. You basically have all the steps you need to start your website or blog from scratch. If you’re feeling overwhelmed, I completely understand. I felt the same way when I first started. But you have the luxury of learning from experience, so your learning curve has been cut drastically! I am sure you get tons of e-mails in regard to blogging. I wanted to just say thank you for sharing your knowledge. I want to blog about my life and share life experiences as well as blog what I am doing to change my life to be genuinely happy. Can you be anomonyous sharing/blogging? If I do not hear back; thank you for the information. This was a great article about blogging. Yes, you can be anonymous when blogging and still be successful. I spent the first 3 years of blogging doing so without posting my image or full name. It’s definitely possible to build a blog and share helpful information while being anonymous, but if you’re trying to share life experiences and relate with people on a personal level, you may find it easier to connect if you aren’t anonymous. Either way, I’m glad you’re taking the next steps to start blogging! Good for you!